After weeks and even months of speculation, the news is out on the San Antonio Talons, and it’s not the news we were hoping for. Sources confirmed on Monday the Talons have all but ceased operations after failing to find an owner. The news comes after a season that was as bad as could be, as the Talons were league owned after a tumultuous offseason. Long time General Manager Keith Racine says it’s a shame for the team’s loyal fans. Spurs Sports And Entertainment, the group that owns the San Antonio Spurs, San Antonio Stars, San Antonio Rampage, and the Austin Toros, was one of the groups interested in purchasing the Talons, and even entered negotiations in late August. However, according to several sources, the Spurs bid to buy the Talons was rejected by the AFL. 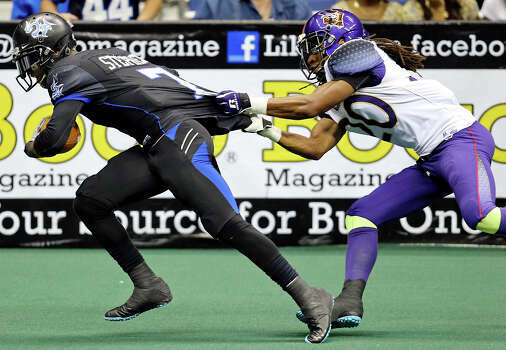 Dj Stephens breaks away from a New Orleans Voodoo defender during the Talons-Voodoo week 10 game in San Antonio this past season. “Through a series of circumstances, the league was unable to identify and strike a deal with a new ownership group,” Racine said. The AFL took control of the Talons after owner David Lynd ran into financial issues. Lynd had filled for divorce in April 2013 and his bank accounts were frozen thus he was unable to pay his league dues. The issues were so severe that The Lynd Company; which had provided the Talons homes and apartments, actually elected to no longer provide those things to the Talons and even kicked some of the players out of their apartments. Lynd was also sued a week before Christmas over a real-estate deal that he and the South Texas Medical Center had agreed on. The attorney representing the Medical Center said David Lynd used the lure of the deal as a ruse, designed to get some free production work done on “Guts And Glory”, the Talons reality tv show. The lawsuit goes on to allege that no one got paid for all those production and editing hours, and that David Lynd never intended to pay for it all. The AFL then took control of the team, and in a controversial move, choose to run the team for the 2014 season instead of sell it to Armando Montelongo, the former Flip This House star who was in talks with the AFL to buy the Talons. However it wasn’t until January, about 10 days before the start of training camp and only two months before the season opener, that the Talons were released from “transaction hold,” which prohibited coach Lee Johnson from assembling a coaching staff and recruiting and signing players. The delay contributed to the team’s struggles, as most premier AFL players already had signed with other teams. The Talons suffered through a dismal 3-15 season. 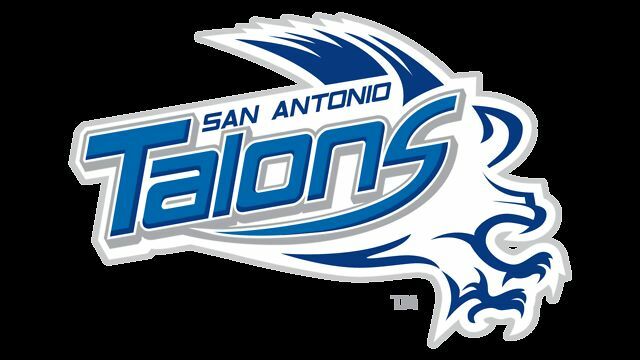 The Talons fan club; The Black N Blue Crew, made a fan petition to try to show that there is support for Arena Football in San Antonio. It ended with 2,059 signatures. The team was given a deadline of August 23rd to find ownership, then had it pushed back to September 8th due to the Spurs entering negotiations. The Spurs put in a bid according to sources, but to the surprise of most AFL fans, the AFL rejected it. 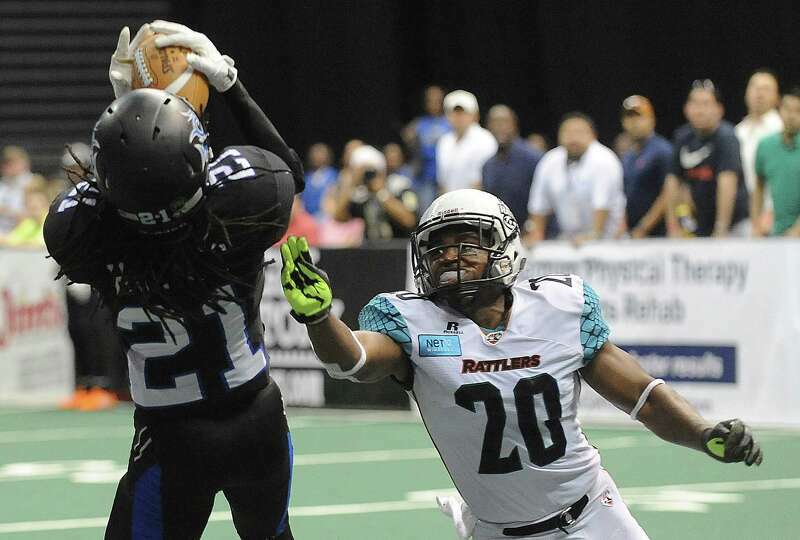 Brent Holmes Catches A Pass During The Talons-Rattlers week 14 game in San Antonio this past season. The Talons moved to San Antonio from Tulsa following the 2011 season. The team was brought to town by Jason Lohe, but he left before the 2012 season and David Lynd took over as owner. Things could not have started better. In their first year in San Antonio, the Talons went 14-4 and had home field advantage throughout the playoffs. 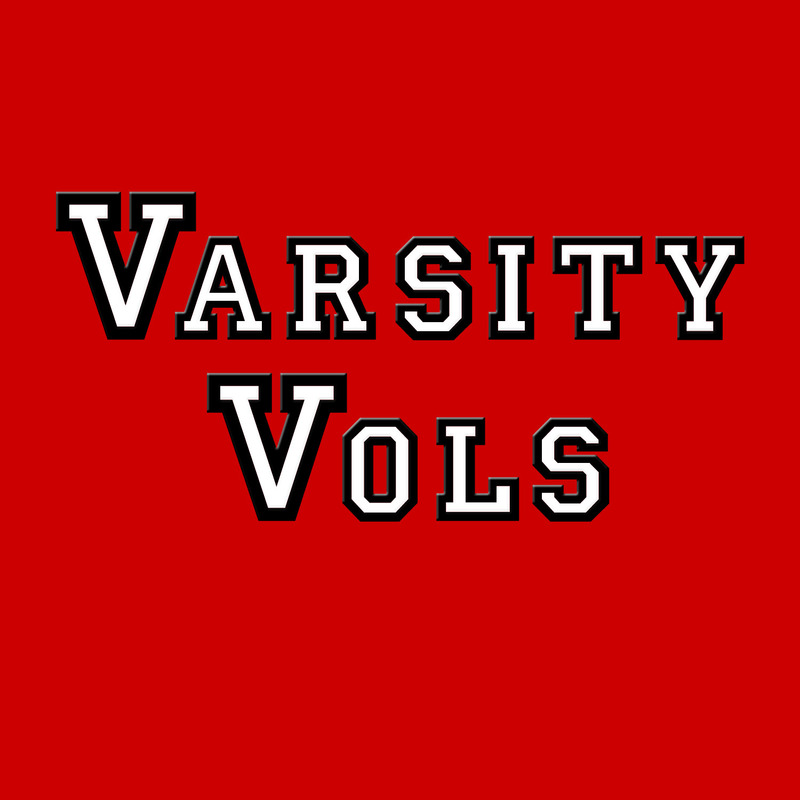 In 2013 they finished with a 10-8 record despite playing 9 quarterbacks. Since then, things have gone way off course. The Talons being taken over by the league caused a decrease in attendance at the Alamodome, but the numbers were still fairly good according to team CEO Keith Recine. Recine also said the franchise was fairly healthy despite the off season problems. The Talons prevention from recruiting was a big reason why the team struggled in 2014. 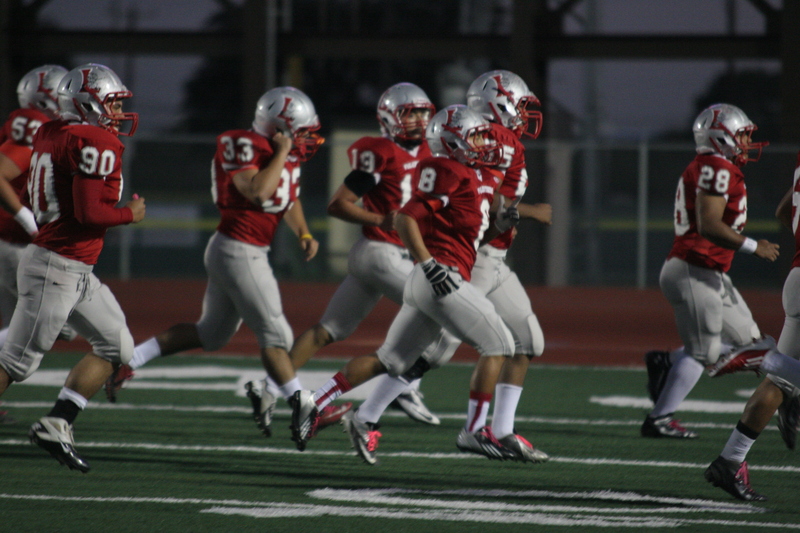 In addition to the 3-15 season, the team suffered a 10 game losing streak. Coach Lee Johnson even tried to make some transactions late in the year that got denied by the league. Its the second straight year an AFL owned franchise has folded. In 2013 the Chicago Rush were seized by the league twice after their owners either failed to meet expectations or were criminals(David Starall). The AFL also took control of the Orlando Predators in May, but 2 months later the league sold them to David Siegal. There are a lot of questions that Talons and AFL fans want answers to. First, were the Talons a success? Some people may say no, but looking at the three years the Talons were here, its clear that they were. Fans packed the Alamodome most if not every night to see the high scoring excitement that is the AFL. On the field the Talons may not have been perfect, but they were good enough to finish with a 46-45 record, and to be honest the 2014 season needs an asterisk next to it. This team was a hit with the fans, and the city of San Antonio is a favorite for the AFL. “They(the AFL)think that this is a place where the league can succeed” said Recine. Another very interesting question is how long will San Antonio wait for the AFL to make its third stop here? In 1992, San Antonio welcomed its first AFL team, the San Antonio Force. That team played only one season, but it was because they couldn’t find any open dates at the Alamodome, as the Hemisfair Arena closed after the 1992 season. The Alamo City then waited 20 years for the Talons to bring the AFL to San Antonio for the second time. Now 3 years later, the Talons are gone and San Antonio is for the moment without pro football and will be without it in 2015; unless the Oakland Raiders move to San Antonio after this NFL season. However, several sources say the AFL may return to San Antonio in the not too distant future. One source says it could be an expansion team with a new name, anther says a team may likely return in a year or two. Given that the AFL likes San Antonio as a market, it wouldn’t be surprising if it happens. The Alamodome is a venue that the AFL likes, and it would have looked great at the AT&T Center or the Freeman Coliseum. Is it possible Spurs Sports And Entertainment could be granted an expansion team for 2016? According to the social media manager for arenafan.com, a website for fans of the AFL, speculation around the league has been rampant for weeks that the team would go dormant for 2015 with the possibility of returning for 2016 if a new owner — possibly the Spurs — could be secured. SS&E president Rick Pyke says that SS&E is always interested in bringing other varieties of sports and entertainment to San Antonio, so SS&E may defiantly go after a team in the future. An official with SS&E issued a “no comment” via email. “San Antonio is a very desirable city for the AFL and efforts will continue to bring Arena Football back to the Alamo City; The AFL has the utmost appreciation for the passion and support Talons fans have shown their team and we look forward to returning to San Antonio.”.